Antarctica Travel Centre specialises in small-ship cruises to the Antarctic Peninsula, the Falkland Islands and South Georgia and can tailor an Antarctic cruise to suit your personal requirements. Antarctic experts will help you select the right vessel (luxury, expedition or fly-cruise), itinerary and season to ensure your holiday really is a once-in-a-lifetime experience. As a member of the world-leading industry organisations overseeing responsible travel to Antarctica, the Antarctica Travel Centre has hand-picked a number of smaller vessels and trusted operators to help you realise the holiday of your dreams. Arctic Travel Centre specialises in small-ship cruises to the Artic and can tailor a cruise to suit your personal requirements. Arctic experts will help you select the right vessel, itinerary and season to ensure your holiday really is a once-in-a-lifetime experience. Arctic Travel Centre has first-hand experience of the Arctic and can look after all aspects of your holiday: flights, pre and post voyage arrangements and, of course, your voyage. As a member of the world-leading industry organisations overseeing responsible travel to Arctic, the Arctic Travel Centre has hand-picked a number of smaller vessels and trusted operators to help you realise the holiday of your dreams. The High Arctic circles the top of the globe from Russia’s Far East to Svalbard. Covered in sea-ice for most of the year, it is only during the short summer months (May to September) that it is possible to witness the stunning scenery, incredible and diverse wildlife and interesting indigenous communities the Arctic has to offer. As the pack ice recedes and the temperatures rise, the race is on for all living creatures to make the most of the short summer. There’s a lot to see: Polar bears, walrus, seals, Arctic foxes, millions of seabirds, remote villages, icebergs and magnificent scenery and historic sites all make for an unforgettable holiday. Antarctica Travel Centre and Arctic Travel Centre have selected 10 of the best Polar ships to deliver you to these wondrous wilderness areas. All vessels have less than 200 passengers, three with a maximum capacity of less than 100, and fall into three categories: Luxury, Expedition and Fly Cruise. These ships/voyages maximise time in Antarctica, or the Falklands and South Georgia by overflying some of the longer sea crossings, including the Drake Passage, to land closer to the destination. Combining a more traditional-style of ‘cruising’ with an Antarctic or Arctic adventure, these ships offer large, very comfortable cabins with en-suite facilities and many suites have private balconies. The on-board service is excellent as is the cuisine. Most also offer wellness programs, a spa and well-equipped gymnasium. They all have a fleet of zodiacs, expert guides and knowledgeable expedition leaders occasionally with special guest escorts. Many of the ships in this category are larger vessels, several with up to 200 guests, and focus on the on-board experience as you’ll spend more time on the ship compared with a smaller ‘Expedition’ style voyage. Expedition ships generally have a greater emphasis on maximising time off the vessel or out on deck. All three ships in this category have fewer than 100 guests, giving you the opportunity to visit more sites or to spend more time ashore as well as more flexible excursions, special interest activities and hikes. Cabins are generally smaller than on luxury ships and and the food is excellent. Expedition doesn’t mean ‘budget’; guides are of an equally high standard and there is a strong focus on the total guest experience. Kayaking in Antarctica or the Arctic is probably one of the most intimate and inspiring ways you can explore these incredible regions, gliding through the silent waters, taking in its magnificent beauty, and perhaps experiencing close encounters with wildlife. Not very many people have the opportunity to say they’ve camped on the ‘7th Continent’. Spend a night listening to the crackling and grumbling of glaciers, the splintering of icebergs and the soothing sounds of water and brash ice washing onto the beach, breathing pristine air and experiencing something very few others have. A great introduction to Antarctica, exploring the world’s last great wilderness. These voyages start operating in late December as the ice recedes and vessels can usually push a little further south, with the goal of crossing the Antarctic Circle – a great option if you want to experience more of the Peninsula, more wildlife and more amazing polar scenery. After all, Antarctica’s a very long way to go! If your time and budget will stretch to a longer trip, these voyages offer an incredible experience of the sub-Antarctic islands as well as the Antarctic Peninsula. Be warned – many people choose a shorter voyage, only to find themselves travelling back to Antarctica on a second trip to include the fascinating Falkland Islands and South Georgia, with all its stunning wild beauty and accessible wildlife. South Georgia is one of the most stunning places on earth. This small archipelago rears up from the Southern Ocean to a height of almost 3,000 metres and is home to millions of birds. The rugged landscape forms a dramatic backdrop to the many beaches and coves which are home to millions of penguins and petrels, thousands of elephant and fur seals and hundreds of albatrosses. For the more adventurous traveller, this expedition extends your time on the Antarctic Peninsula by 2 additional nights, with the goal of sailing farther south in an attempt to reach the Antarctic Circle (66° 33’ S). If wildlife is a major interest then Spitsbergen (the largest island in the archipelago of Svalbard) should be on your list. 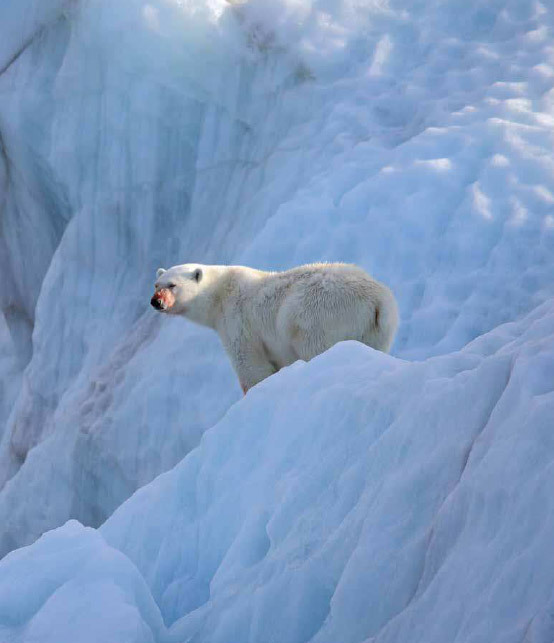 Spitsbergen’s wildlife is protected and has been for many years, as a result you have the chance to view the animals in their natural state and often in great abundance and often up-close. Spitsbergen, a Dutch word for ‘pointed peaks’, is one of the most beautiful wilderness areas in the world. The bird life is prolific, and with several well know ‘hall-outs’ for walrus there’s a good chance to see and photograph many of the Arctic’s most wonderful inhabitants including Polar bear. The High Arctic are the areas visited a long way north: north of the Arctic Circle and most of Alaska. One of the gateways into this region, via a flight from Ottawa, is the remote community of Resolute, described as "not the end of the world, but you can see it from here". You will be drawn to this area by the variety of scenery and wildlife as well as the knowledge that you’re venturing where few people go. Baffin, Devon and Ellesmere Islands all offer incredible scenery: mountain, fjords, glaciers and pack ice that make up this wilderness area and provide homes for rare and interesting wildlife including: muskox, walrus, beluga whales and polar bear. The Canadian High Arctic also offers history and culture of the region and a chance to follow in the wake of some of the most amazing and daring explorers. There’s also a chance to meet the Inuit, who carry with them the spirit of the North and who will enchant you with stories of life in the High Arctic. Everything about Greenland is big: it’s the largest and oldest Island on our planet. With most of the Island covered in an enormous ice cap it’s the coast where the maritime influences combine with incredible glacial scenery to offer ‘big’ experiences. Even the names follow the ‘big’ theme, Qeqertarsuaq translates literally as ‘large island’ in the local inuit language. After the main landmass of Greenland, this is the territory’s second largest island and one of the ten largest islands on earth. In addition to enormous fjords, glaciers and icebergs, Greenland also has great historic and geological interest. Whilst dwarfed by its northern neighbour, Iceland offers great contrast with volcanoes, geysers, hot springs and lava fields. Massive glaciers are protected in Vatnajökull and Snæfellsjökull national parks. Iceland’s bird life is excellent, being a little further south than Greenland, there is greater variety of seabirds including large colonies of puffins. Iceland shares its Viking history with southern Greenland. Currently there’s only one vessel that can take travellers to the North Pole; the nuclear-powered icebreaker 50 Years of Victory. On your cruise to the North Pole, watch (and feel) in amazement from high above the frozen surface of the Arctic Ocean, as the ship forces it way over and through sea-ice. Generating 75,000 horsepower, the ship can force its way through sea-ice up to three meters thick. This is a one-of-a-kind trip with the single-minded goal of reaching 90 degrees North. There will be opportunities to view wildlife, including the polar bear. On the return journey you’ll visit the archipelago of Franz Josef Land, home to walrus, seals and many bird species including the rare Ivory gull. The major gateways to the High Arctic are Ottawa, Edmonton, Reykjavik, Oslo and Helsinki/Murmansk for North Pole Voyages. Arctic Travel Centre can look after your needs in all of these gateway cities and can extend your holiday with excellent local partners who are well placed to look after you. 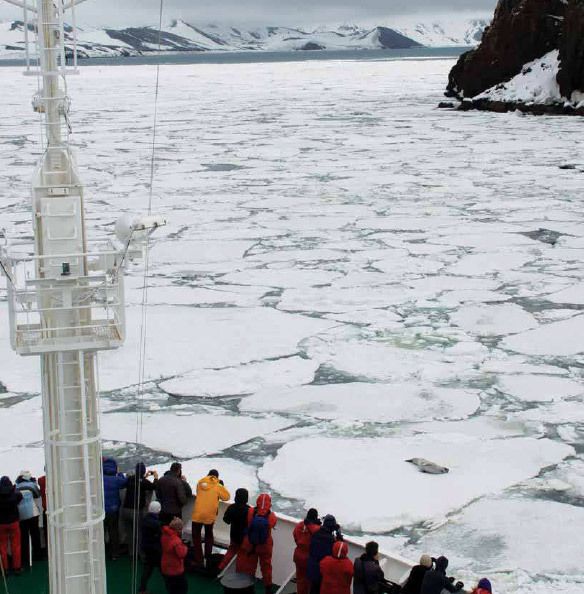 People who ordered Antarctica & Arctic Cruises also ordered the free travel brochures below. Click on the images to find out more about these brochures.